Baby showers are often organized as ways to help new mothers prepare for the arrival of their newborn baby. From receiving items such as clothing and personal care items to helping organize the shower celebration itself, there are many things that can be done with a baby shower to do list. The first baby shower to do list template to be reviewed is more of a checklist to help organize when specific duties involving an upcoming baby shower should be completed. The first part of the checklist states not only who the baby shower is being held for, but as well as the date and time of the shower and the location of the gathering. Following this is a task list that is separated into three separate sections: task, time, and notes. The “task” sections lists the specific task that needs to be performed, while the “time” section lists the approximate date and time that this job needs to be done. The “notes” section simply lists any extra notes having to do with the jobs that are to be performed. This is a rather simple template that can be easily edited in any version of Microsoft Excel or any similar program according to your specific needs or wants. The next baby shower to-do list to be reviewed is organized more like a checklist, but is also much easier to read at the same time. At the top is listed the fact that it is a baby shower to baby shower ideasdo list, followed by different amounts of time, which can be easily adjusted depending on your specific needs or wants. 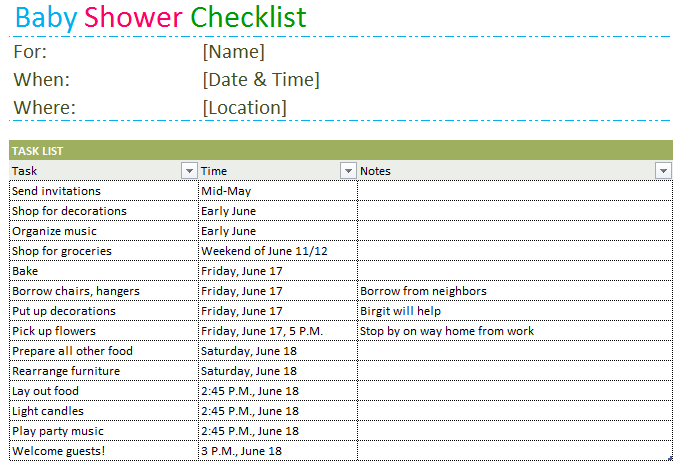 This particular template lists five weeks as the latest amount of time to get certain tasks done before a baby shower. The lowest amount of time listed on this template is one to two days before a baby shower takes place. Under each amount of time listed, certain tasks are placed by check boxes, which are then checked off when the tasks are completed. This particular template was created in Microsoft Word and, again, can be easily edited as needed. 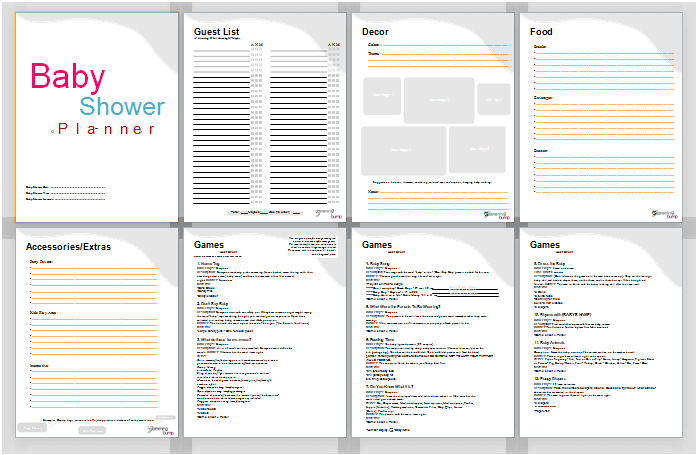 The final baby shower to-do list template to be reviewed is a much more complex one, as it lists a combination of many different things and acts as more of a planner. Firstly, it lists the date, time, and location of the baby shower itself, followed by a detailed list of guests. This guest list includes check boxes next to each name with three different options: attending, maybe attending, or not attending. At the bottom of this guest list is a space to write in the total number of guests who will be attending, as well as those who may be attending. Additionally, there is also a space for the total number of children who may be in attendance as well. Listed next are ideas for the overall decor of the baby shower, followed by a listing of the various foods and beverages that may be served at the event. Next up is a list of accessories that can be included such as party favors and a kids area, followed by a list of games that can be played at the event. This is another template that was created in Microsoft Word and, of course, can be edited in any fashion depending on your specific needs or wants.